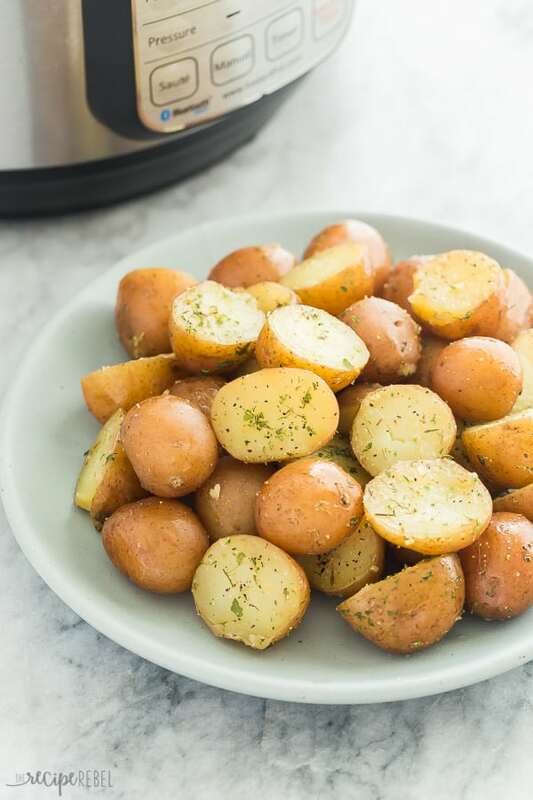 These Garlic Herb Instant Pot Potatoes are so creamy inside, so easy to make and loaded with flavor! Just a couple minutes prep is all this delicious side dish requires! 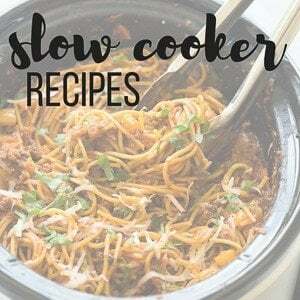 I never thought that Instant Pot potatoes would be the thing to win me over with pressure cooking, but what can I say? They are so easy to cook, come out so fluffy inside, and the cook time is hands off. What could be better? These Instant Pot Baked Potatoes were my first love, and these Instant Pot Mashed Potatoes were my second, but these garlic herb Instant Pot potatoes are right up there. They might even have taken first place! The garlic herb combo is one I never tire of. It adds so much flavor, without a lot of ingredients, prep time or even calories, making this a healthy side dish recipe loaded with potassium and fiber, that compliments any meal! All types and sizes of potatoes require different cook times in the Instant Pot. 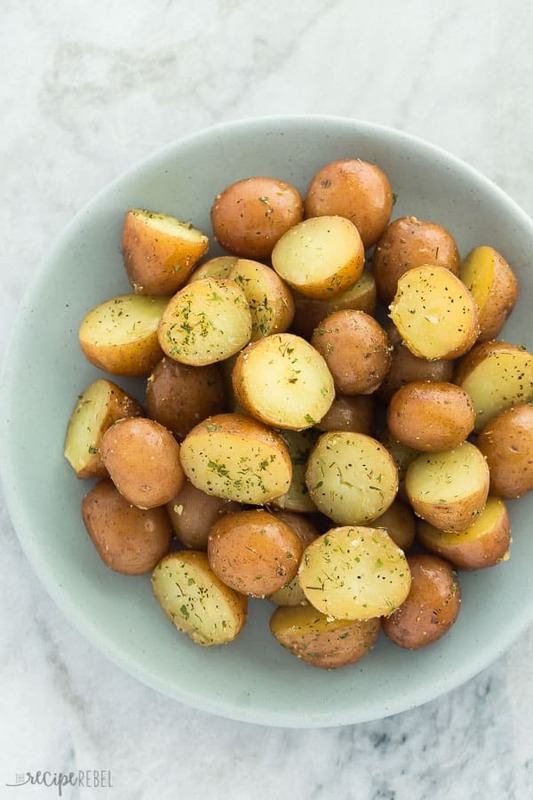 For these small, Creamer potatoes, 2-3 minutes is plenty (don’t overdo it! Mushy potatoes aren’t that appetizing). For larger, “baked” potatoes, 15-20 minutes is necessary, and sometimes longer if the potatoes are quite large. For diced potatoes when mashing, 2-3 minutes is lots, as the pieces are so small to begin with. When cooking potatoes in the pressure cooker, a quick release is recommended (especially with the smaller potatoes as they will become overcooked more quickly). With Instant Pot baked potatoes, a natural pressure release may be better. If you don’t have Creamer potatoes, you can make this recipe with cubed red potatoes (about 1″ in size). The cook time won’t change! 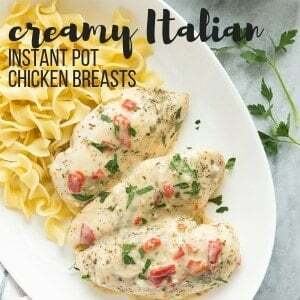 If you want to jazz up these Instant Pot potatoes, drain the broth and add a splash of cream and a teaspoon of basil pesto. If you want a cheesy twist, drain the broth, add a drizzle of ranch and a sprinkling of shredded cheddar cheese. Canadian friends! 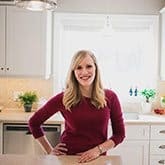 For your convenience, I’ve partnered with reebee to link these ingredients to open in the reebee app, where you can easily find the best deals on everything you need for this recipe. In it, you can view all the flyers in your area and see what’s on sale, and where! I’ve been compensated for my time, but all opinions are my own. Halve larger potatoes if desired but leave smaller potatoes whole. 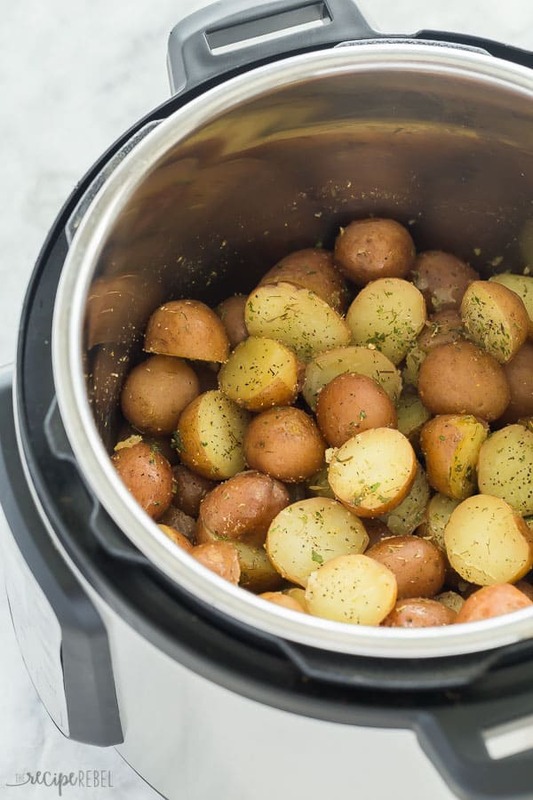 Add potatoes to an Instant Pot or electric pressure cooker. Pour in the broth and season with 1 teaspoon salt. Put the lid on and select Manual or Pressure Cook for 2 minutes. 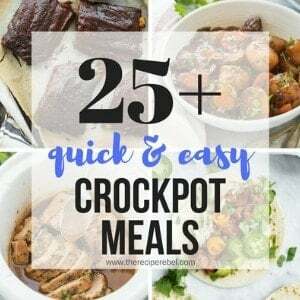 The Instant Pot will take about 10 minutes to reach pressure and begin counting down. Once the cook time is up, let the pressure release naturally for 5 minutes, then open the valve to release remaining pressure. Drain the liquid from the pot and add the butter, remaining 1/2 teaspoon salt, parsley, garlic, thyme, and black pepper. Stir until butter is melted and adjust salt and pepper to taste. Serve. *You can cook more or less potatoes than this recipe calls for without changing the cook time or liquid, though I do recommend you adjust the level of seasoning.